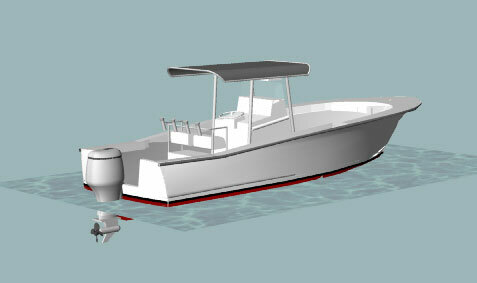 SPORTFISH 26 is a capable inshore or offshore boat with custom high end sportfishing boat looks. She has a deep Vee bow with flat keel and spray chines providing quick on plane transitions and a comfortable ride. Fuel capacity is up to 180 gallons. She is built of cold molded plywood and epoxy with fiberglass sheathing. Permanent frames are used as building molds. Estimated cost for quality construction materials (not including power) is $32000. This cost includes a high level of outfit and finish you can be proud of after putting the effort into building this fine boat. Construction plans are $305. If for any reason you are not happy with the construction plans, return them within 30 days of purchase and receive a full refund. 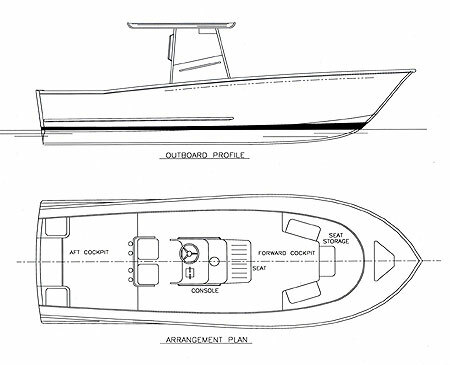 Purchase Construction Plans for the SPORTFISH 26 for $305.00 for delivery by US Postal Service.